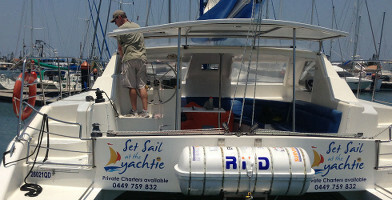 Set sail on the glittering waters of the Sunshine Coast with this range of yacht sailing cruise gift vouchers! The relaxation of sailing combines with some outstanding views of the blue, green and gold that give the Sunshine Coast its character as guests prepare to hoist the sails and try their hand at sailing - or simply laze the day away on the spacious sun deck. Departing from Mooloolaba yacht club, there are multiple cruise sessions and times throughout the day including 10am, 12pm, 2pm and the popular 4:30pm "sunset cruise" option that allows the fading light of the sun to add an extra sense of charm to the proceedings. For a gift that encompasses all the best of the Sunshine Coast's outdoors, grab a yacht cruise gift voucher from the selections below online today. These great gift vouchers provide a great day out on the waters of the Sunshine Coast with a yacht sailing cruise at either 10am, 12pm or 2pm. 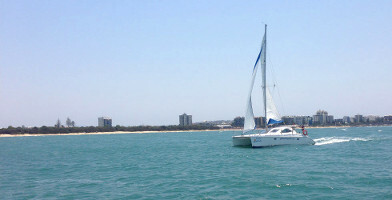 Sail the waters of Mooloolaba on the Sunshine Coast at sunset with this gift voucher for a yacht sailing cruise that is truly not to be missed!